One of the unique assets of Crete is the still strong position of local crafts, in particular furriery, leather and, of course, pottery. During your stay in Crete, the products of this last branch of craft can be found practically at every step. Near almost every house you can see huge clay pots, which nowadays are most often used as pots. If you want to see how these great clay pots are made, plan a trip to the village of Thrapsano ( Θραψανό ), about 30 kilometers away from Heraklion . 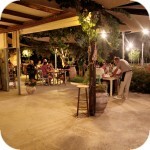 It is next to Margerites, one of the most well-known villages, where today traditional Cretan ceramics are made. Thrapsano is a small town inhabited by slightly over 2,500 people, the vast majority of whom currently live from agriculture. The dominant field crops are olive trees and vines. And although this region is also known for growing flowers, mainly carnations, it is the age-old tradition of pottery that determines the uniqueness of this village. Until recently, the majority of Thrapsano residents maintained their jobs. In the old days, during the summer, pottery tradesmen left their native village, to stop at various places in Crete in temporary workshops, to perform famous pitas. It was these handicraft expeditions called Ventema that made Thrapsano famous almost all over Crete. Since the end of the 1940s, this tradition is no longer cultivated, as modern workshops that are equipped with modern ovens put much greater demands on location. Despite the changes associated with the technique of drying and burning pitos, the method of forming is still the same. And although the potter's wheel is already most often rotated by means of an electric motor, the most important are the skills, knowledge and experience of the potter. Most of the factories located in Trapsano are companies in which the craft tradition has been passed down from several generations from father to son. Imported ceramics pose a considerable threat to the currently operating workshops. The Chinese products, whose price is very competitive with local products, constitute a particularly serious threat. The fate of Greek potters and tourists, which we highly recommend visiting in Thrapsano, will decide about the fate of potters from Thrapsano. I particularly recommend the Michalis Houlakis plant, where under the supervision of the owner you can try your hand at this craft. An unquestionable attraction is also the opportunity to see a real professional in action. Thrapsano is located about 30 kilometers south of Heraklion . Due to the fairly dense network of local roads located in this part of Crete, access to this town is possible in several ways. Depending on the direction of arrival, you can choose one of many roads. I suggest, however, pay attention to signposts because in this region of Crete roads are now often modernized and rebuilt, so you can easily go astray. Of course, the most recent map or navigation with reliable data on the local road network may be helpful. Bez przesady - żyjemy w czasach powszechnie dostępnych i coraz tańszych usług kurierskich - w podobnym warsztacie we Włoszech widziałem ogłoszenie "wysyłamy na cały świat" i koszt wysyłki do Polski był całkiem przystępny - kilkanaście euro. Za sam koszt promu wyślesz pewnie kilkanaście takich naczyń - no chyba ze Grecja ma jakieś straszne cenniki - ale w końcu to są firmy światowe i nie powinny mieć rażąco odbiegających cen w różnych krajach. Wysyłając takie donice z Krety nie unikniesz jednak transportu samolotem albo promem a to podbija cenę przewozu i samej donicy. Druga kwestia to wytrzymałość tych pitosów na polskie mrozy. Z naszego doświadczenia wynika niestety że wystawienie takiej kreteńskiej donicy do ogrodu czy na balkon powoduje że po zimie nie ma czego zbierać, bo glina się rozsypuje w drobny mak. Chora Sfakion is an extremely picturesque mountain village of the mountainous and wild region of Sfakia located in the south-west of Crete. This special placement on the Libyan Sea in a way behind the mountain range of Lefka Ori makes the Chora quite isolated from towns dominated by mass tourism. Currently, access here is not a major difficulty because the roads, although narrow and winding are already covered with asphalt.